Today I am really excited to talk about my friend Ricki Heller’s new cookbook. It’s called Living Candida-Free: 100 Recipes and a 3-Stage Program to Restore Your Health and Vitality . You may already know Ricki from her blog Ricki Heller. She is also the author of Naturally Sweet & Gluten-Free: Allergy-Friendly Vegan Desserts: 100 Recipes Without Gluten, Dairy, Eggs, or Refined Sugar . All her recipes are vegan and gluten free. For those of you unfamiliar with Candida, it is a fungus in the form of yeast. It lives in your mouth and intestines and it helps with digestion. When you have a Candida overgrowth, it can cause many issues. The main one is a leaky gut. Some of the signs and symptoms are: brain fog, frequent yeast infections, autoimmune disorders, skin issues and mood swings or depression. This book not only goes into great detail about Candida and how to fight it, but Ricki shares her own personal story. This is so much more than a cookbook. I am sharing a recipe from the book today. 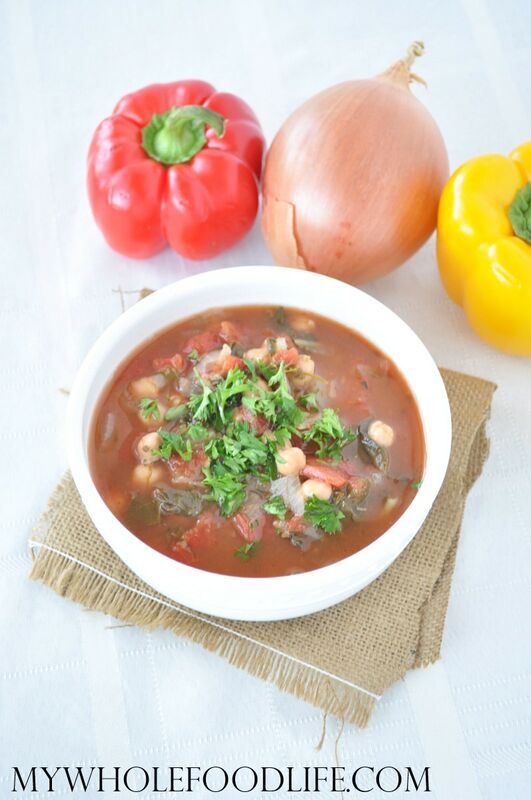 It’s a Chard and Chickpea Soup that is super easy to prepare and also very tasty! Not only is is easy, it’s very budget friendly too! Some of the other recipes I can’t wait to try are: Mojito Smoothie, Grain Free Granola Bowl, Zucchini Fritters, Raw Carrot Cake Energy Balls and Herbed Grain Free Gnocchi. I mean, how good do those sound?? I am also going to be giving away a copy of Living Candida Free to one lucky reader. Look for the giveaway at the end of the post! To buy the book click here. In a large pot , on medium heat, saute the onions and garlic in the oil. Once the onions are translucent, add the remaining ingredients, except for the lemon juice, in the pot. Bring to a boil, then turn down, cover and simmer for about 30 minutes. Lastly add the lemon juice, stir and season to your taste. This can be frozen as well. Enjoy! Side note: I made this in my crock pot, so that is another option for you. Recipe from Living Candida Free. Reprinted with permission. I would love to win this book! Thanks for your awesome articles! I don't have any personal issues with Candida, but I've always been a fan of Ricki Heller's recipes, so I'd love to win a copy of her book! Could use another cook book! So glad you enjoyed this one! Her cookbook has so many other great recipes too!